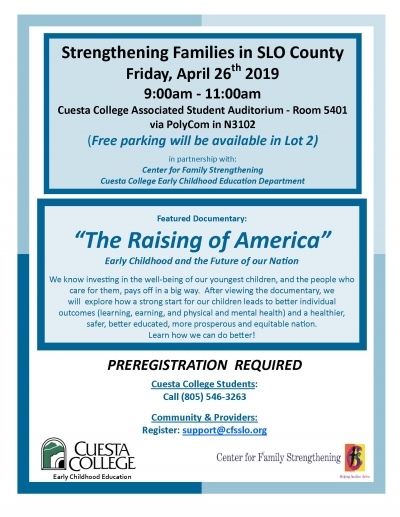 9-11am, Friday, 4/26 at Cuesta College... for students, professionals and community members to learn about the process of reporting incidents of suspected child abuse, how the Child Welfare Services system works, community resources available to help and family-empowering approaches and practices. This year's event will includes the featured documentary "The Raising of America," highlighting the importance of investing in early childhood initiatives. Registration is required. See flyer for details.